Winter never really showed up in Utah this year, except for a few days of cold and snow. In some ways I haven’t minded much; I much prefer driving on clear roads and I don’t relish cleaning up coats, boots, hats, gloves, and scarves all the time. But I also find myself watching the top of Mt. Timpanogos with some worry; there’s not enough snow on those mountains and it will probably be a dry summer. Yet Mother Nature does her thing, and there are bulbs pushing their way up in my yard. I’m excited for my drab, brown landscape to become beautiful again. 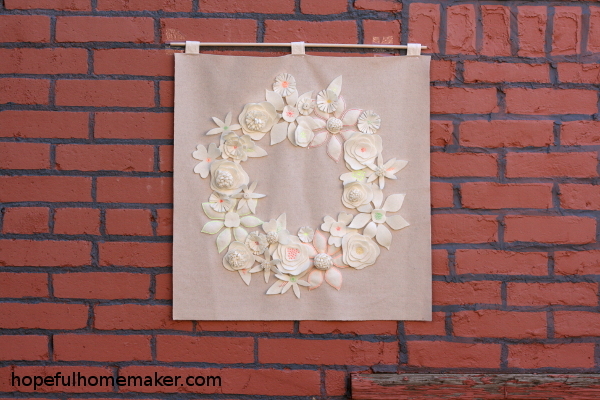 Inside, however, I hung this lovely felt flower winter wreath and it’s brought flowers and beauty to my sewing room all winter long. I first saw the tutorial for this felt project on the Purl Soho blog years ago, but it took me a while to start it and even longer to finish. I really love it. 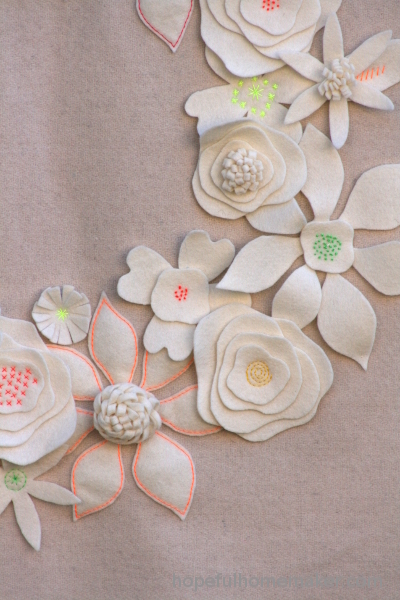 There is something so lovely about the creamy white flowers against the pale taupe background, and neon thread gives it an unexpected element of surprise and sophistication. The tutorial was easy to follow. 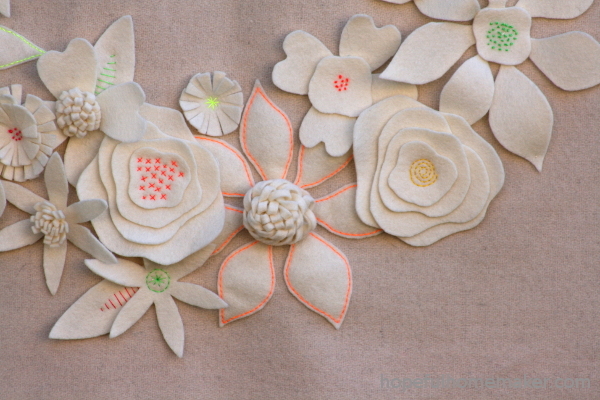 The flowers were simple and easy to make, and I enjoyed sewing them into place. One change I made was to find a piece of wool felt in a local shop for the background instead of piecing squares together. Again, that neon thread! I never liked neon when it was in style, but this thread really makes me happy. (It inspired the neon matchstick quilting on this quilt!) I added some tabs to the top for hanging with a wood dowel. 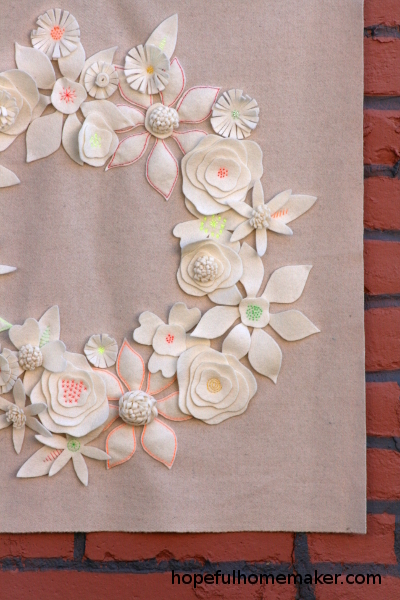 This project also triggered an interest in adding felt to quilts, which is something I hope to try. I have found a couple of patterns I would like to make, and am slowly building a small stash of colored felt. This project, however, is perfect in delicate neutrals. I have moved it from place to place in my house when I’m in the mood for change and it looks beautiful everywhere. 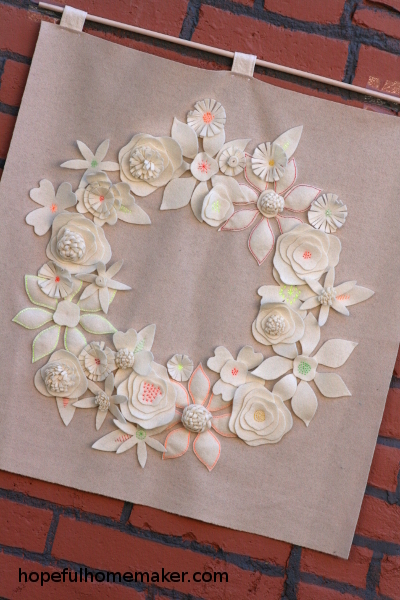 If this felt flower winter wreath is a project you’re interested in, you can find the free tutorial here, along with supplies for making your own. It measures approximately 24″ square. It is a great size for a handwork project, and not difficult to make.